I like pure maple syrup on my waffles, so I was a bit concerned that that vanilla flavor cooked into the waffles would create flavor confusion when mingled with my syrup. Good news! No flavor confusion and no flavor overload. You definitely notice the vanilla, but luckily it adds to the waffle experience instead of dominating it. I'd buy these waffles again if they were on sale. It's always nice to have frozen waffles around the house for hurried mornings, or even as an evening snack. Would Eggo French Vanilla Waffles be my first choice at the supermarket? No. But I'm a waffle-purist. I like an unassuming waffle that lets the topping get equal or top billing. Vanilla waffles, as presented by Eggo, are in a side-category, part of the waffle family, but like a cousin that keeps saying "Look at me, I have a certain talent." You like to hang out with that unique cousin for a while, but despite any admiration you have for his talent, eventually you want to get back to your core family, the people, or in this example, the waffles that don't call attention to themselves. They're just who they are... friends, family, waffles. The short review: If you like vanilla and you like waffles, you'll like these vanilla waffles. A serving is comprised of 2 waffles: 200 calories, 8 grams of fat (1.5 grams Saturated Fat and 2.5 grams Trans Fat) with 10% to 20% of many side panel nutrients. *Price reflects a 12.3 ounce box containing 10 waffles. 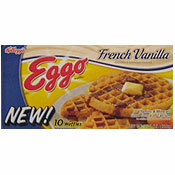 What do you think of Eggo French Vanilla Waffles? You can only buy them in a ShopRite in New Jersey. Unfortunately. I love them and need them in my life. Can I place my own order, they make breakfast but also dessert, I usually toast the waffle out a little syrup then top it with Baileys ice cream and whip cream ummmm. My children love them, however I have not been able to find them any more. Are they discontinued??? Appears to have been discontinued. No longer listed on their site as a current product. My family and I love these waffles. Where can we find them? By Where Go My Eggo? These waffles are really awesome. My kids love them but we have not been able to find them in the local grocery stores. Does anyone know where we can find them? We contine to look. I live in South Texas and I can't find them anymore at our local HEB or Walmart Food Center. 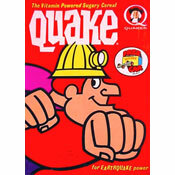 Does anybody know if they are discontinued? I love this product, but I can't find them at my kroger store. I live in Lawrenceville, Ga. and shop at kroger on buford drive. French vanilla is my favorite. "You stock um I'll buy um." They're pretty good. You can actually taste the vanilla.